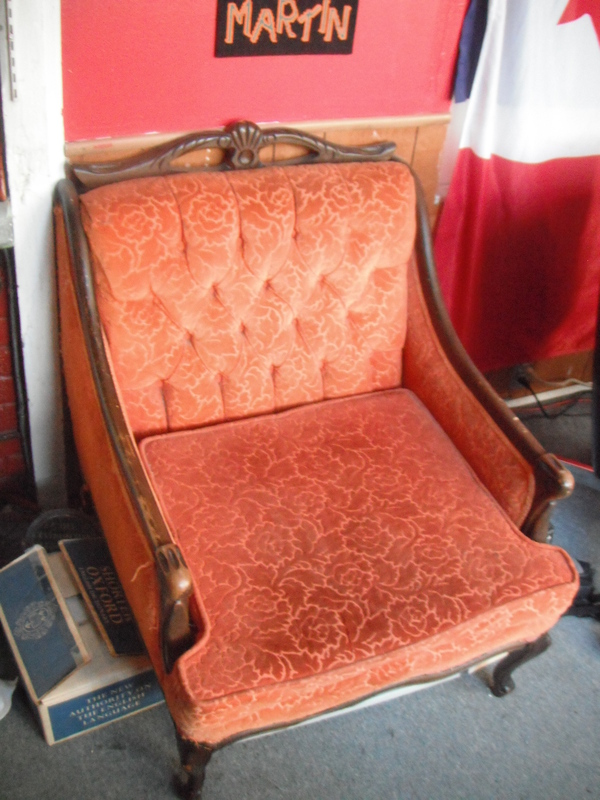 I found this chair the night before I moved to Montreal from Gatineau. I took a walk to help collect my thoughts, and there it was. It smelled like cat pee a bit on the upper right corner, but it didn’t seem like a chronic cat pee, more like a one-time only sort of thing. I thought I could get the smell out, and I did using some pet odor remover stuff. I love this chair a lot, even though I never really sit in it. I really like the orange hue, and it’s quite comfortable. It’s in pretty excellent condition as well. I think it’s probably from the 40s, but I’m not sure exactly. Very nice chair. Looks sturdy, and the wood is in great shape.